Incredible Stories. Remarkable Achievements. Empowering the Future. 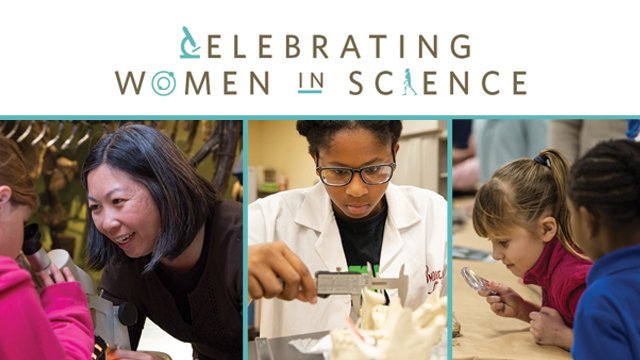 Celebrate the incredible achievements of female scientists at the Museum, in Northeast Ohio and beyond at Women in Science Day, Saturday, February 9 only at the Cleveland Museum of Natural History. Hosted by WKYC Channel 3 Chief Meteorologist Betsy Kling and featuring female science professionals and students from across the region, Women in Science Day is your chance to explore the unique opportunities and challenge that face women and girls looking to follow their passion and curiosity for science into a career. Who can be a scientist? What career possibilities are there for women and girls in STEM fields? We’ll explore these questions and more at Cleveland’s official celebration of International Women and Girls in Science Day. Meet and greet female science professionals and students from across the region, explore the diversity of science careers and understand the challenges women face in pursuing their passion for science. Take a tour of the cosmos with a female astronomer as your guide in this special, live show in the Shafran Planetarium. Tickets required and available for purchase at Admissions Desk. $3 per person. Betsy Kling, Cleveland’s first female chief meteorologist, will lead a panel discussion of science professionals and students from each major field of STEM to talk about how they first discovered the curiosity for science and how they continued to pursue their passion to this day. Join the panelists for a special meet-and-greet and ask one-on-one questions about their experiences and accomplishments.